Let’s be real: you either love or your hate biking. Living at The Frasier makes it easy to love the sport. The community is geared (ha!) toward bikers and even offers its own bike storage and a repair station. No need to drag your bike into your apartment every day. And Alexandria is a cyclists dream come true. Use this guide to learn all about bike trails and safety in Alexandria – and shops where you can maintain your bike. Ride on, Frasier-ites! If you’re looking to check out D.C.’s monuments and get in a good workout, head to the Mount Vernon Trail. You can take in stunning views of the Potomac River or can just cruise by Old Town Alexandria. It’s perfect for a long afternoon ride or just a short jaunt. If you’re looking for a challenging trail that will let you soak up Alexandria’s rich history, take a spin on the Alexandria Heritage Trail. This 23-mile long trail weaves past sites like the former location of Bellevue Plantation and Sugar House—a day spa that was once a sugar refinery. For a map complete with even more trails (yes!) located throughout Alexandria, please visit this link. 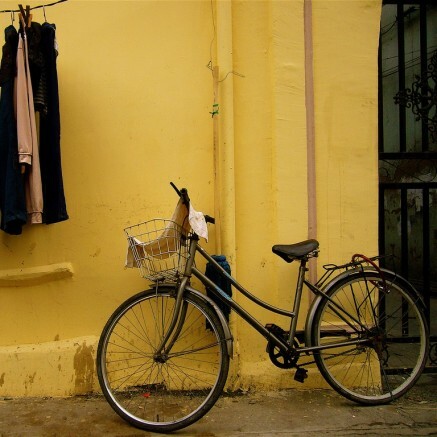 Alexandria is home to plenty of local shops that can help you maintain your bike or buy a new one. Spokes Etc., Bicycle Pro Shop, Wheel Nuts Bike Shop and Big Wheel Bikes all have the supplies you’ll need to keep your bike up. If you’re looking to meet other cyclists and maybe even take bike maintenance classes, consider going to the VeloCity Bike Cooperative on Mount Vernon Avenue. At this co-op, you can learn how to fix your bike, buy a used one, or donate materials. This organization also offers community outreach and youth programs in addition to community bike rides and social events. If you’re new to the area, you might want to visit to help meet bike enthusiasts. You also can volunteer if you’d like to do some community service and make others feel good. Bikes must follow the same traffic laws that motorists do. Cyclists must follow the flow of traffic and remain on the right side. In Alexandria, all riders ages 14 and older must wear helmets. Bikes can be brought on the Metro except during rush hour (7 to 10 a.m. and 4 to 7 p.m. weekdays). You can bike on the sidewalks, except on King St. east of West St. (towards the waterfront) and on Union St. between Cameron and Prince. Many local vendors in Alexandria provide cyclists with water bottle refill stations. You can use the“Tap It” app to find these spots around town. Now that you know that Alexandria is a great city for cyclists, you’ll want to live in a community that’s equally as bike-friendly. And that community is The Frasier. This amenity-filled property is the dream home you (and your bike) have been waiting for. Contact us to start the leasing process today. Before you know it, you’ll be spinning your wheels all over Alexandria.